the space in between: Show. Don’t Tell. In Jesus we find one who lives, breathes and acts upon the expectations of the prophets and enacts the essence of the Law. Jesus reveals God to us not in words but in the flesh, in what he does and has done. He is God’s revelation, which shows to us what God does in concrete terms. Simply put: when Jesus does something, God does something. When we look at Jesus’ life and see what he did for us and how he lived, we know not only what Jesus is like, but also what God is like because as the Word Jesus explains God to us. He shows us what God loves and what God’s love is like. This is the mystery of the incarnation that salvation is here and now in the person of Christ who has shown us in his life and deeds on earth that God loves and seeks to have fellowship those whom he created. Hence, to celebrate Christmas in light of understanding the incarnation is to bear witness to an amazing act of gracious condescension, that God the Son assumed our flesh. It is interesting to note that what we often forget is that divine revelation functions as a two-way mirror. It doesn’t just reveal God to us, but likewise reveals us to God (and also to ourselves!) now. We live our lives by following the plot of our individual narratives. We live according to our personal story that hinges on fundamental decisions that are brought into light in the incarnation. Will we be on the side of light or darkness? There are only two alternatives open to us –to choose either light or darkness. What is asked in this decision goes beyond a mere affirmation of the abovementioned truths in faith because wisdom is vindicated by her deeds (Mat. 11:19 ISV), which renders the need to make our actions speak louder than our words even more apparent. Perhaps this is the choice that we are brought face-to-face with this Christmas: to choose whether or not we would still persist in the darkness of domesticating Christ as an abstract theological construct or to choose become like Christ who went out and showed us God’s love in deeds of mercy, healing and ultimately self-giving to the point of death. Christmas challenges us to Christlikeness, in both word and deed. It dares us to exhibit an implicit preference for grace over judgment, by the bid for unity amid diversity and by an abiding faith in a God who is present and active in all reality. Merry Christmas, may this season remind us of the call to participate in enlivening the Living Word that is at work in shedding light into this dark world. Historically and experientially growing up as an Evangelical the passage has often been used as a expositional reference to explore the doctrines of: 1) God’s “Omni-Attributes,” which emphasizes that the Christian God is all-good, all-knowing, all-powerful" deity. 2) The “hypostatic union” which attempts to explain the union of Christ's humanity and divinity. 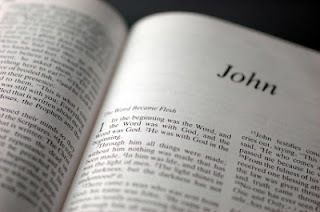 In this reflection I have chosen not to dwell on these topics but instead choose to delve into its ethical implications as I believe the passage in the first chapter of John’s Gospel is also a wellspring of resource on that matter. Here I paraphrased the John 1:18 in light of the original Greek word, used, exégeoma, (the word where we get the term exegesis which often pertains to the act of preaching words from the Bible) that is translated as “made known” could be translated more literally by saying that Jesus has “explained” God to us.